Second Chances Girl - a Miami family and lifestyle blog! : KiteReaders Tablet Accessories Giveaway! Getting ready for the holidays? Well you probably should be since they are getting close? Wouldn't it be awesome to win some tablet accessories instead of buying them? I think so. 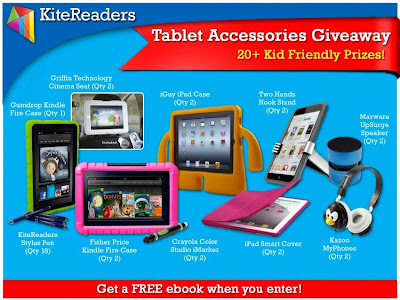 Enter the KiteReaders Tablet Accessories Giveaway and you have a chance to win one of over 20 kid friendly accessories!! You also get a FREE ebook just for entering, so really, there's nothing to lose! ALL ENTRANTS GET A FREE EBOOK DOWNLOAD!! !